My first book published is a valuable resource for those moving forward in their walk with God. This book provides hope for those who are tired of themselves and religion. 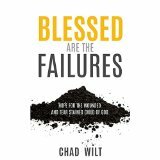 Blessed are the Failures is now in print! You can find a copy at Amazon or Barnes and Noble.